An insurance premium refers to how much your insurance policy costs, usually on a monthly basis. Insurance premium is just a fancy word for the cost of your insurance policy. Usually, insurance companies give you a monthly price, such as $5/month. To find out how much it’d cost to insure your apartment or home (aka your insurance premium), you’ll need to first get a quote, which generally requires filling out info online, talking to a customer service representative or underwriter on the phone, or, in Lemonade’s case, chatting with an AI bot. Your renters or homeowners insurance premium pays for the coverage of your policy. starting at $5/month. This surprises most people, but it’s how insurance works! Insurance is based on the idea that paying a small amount of money for protection each month is better than paying nothing and being left totally on your own to pay for damages to your stuff. How much does an insurance premium cost? First off, different types of insurance coverage have different baseline prices. Say you’re looking to get renters insurance. 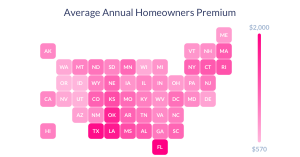 Your premium will probably be much lower than someone looking to get homeowners insurance. Why? Well, homes tend to cost much more than apartments, and home insurance covers the actual structure of your home, while renters insurance only covers your stuff. Another big factor is the amount of coverage you choose. For example: If you own $40,000 worth of stuff, and your best friend owns $20,000, your premium will probably be a bit more expensive (depending on other factors). And if you choose a $1,000 insurance deductible, and your bestie chooses a no deductible option (what we call Zero Deductible at Lemonade HQ), her premium will be more expensive, because she’s taking on a greater risk than you are. And finally, some of your personal info will determine the price of your premium. This includes your claims history, the type of home you own, the location of your place, and the condition of your property, among other things. So, as you can see, premiums aren’t a one-size-fits-all-model. Your price will depend on a variety of factors, and ultimately be a reflection of how much risk you present to a potential insurer. How do insurance companies calculate premium? Traditional insurance companies bring in people called actuaries to manually calculate risk levels and premiums. Btw, several companies are now using algorithms and bots to price out insurance policies. There are several bonuses to this, one being that AI can actually make your premium lower! How? AI means less overhead costs to hire several hundreds of actuaries to price out insurance policies. Score.